Bologna and Modena are located in the northern region of Emilia-Romagna. 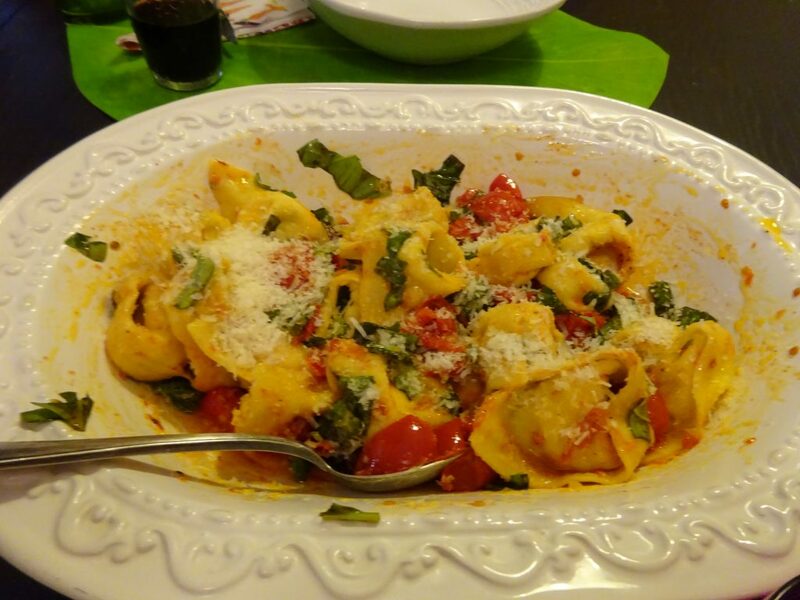 Home to prosciutto di Parma, mortadella (the inspiration for Oscar Mayer bologna), pasta alla Bolognese, tortellini/tortelloni stuffed pasta, Parmigiano-Reggiano cheese, and aged balsamic vinegar, this region is a food-lovers paradise. This region often gets skipped by tourists on the Venice-Florence-Rome travel route, which makes it all the more special. 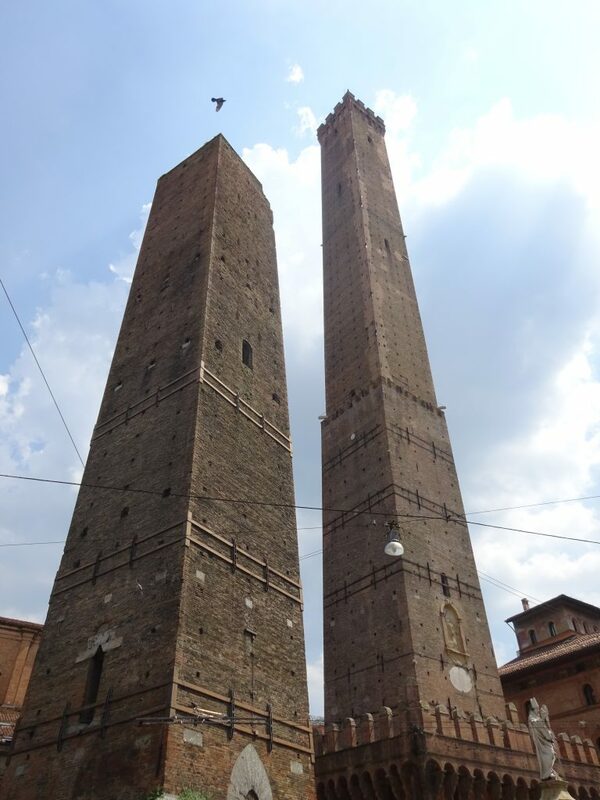 Bologna is the capital of Emilia-Romagna, the seventh most populous city in Italy, and a major transportation hub (many trains stop in Bologna, and it is home to a major airport; Turkish Airlines has a fairly inexpensive flight from SFO to BLQ, by way of IST). 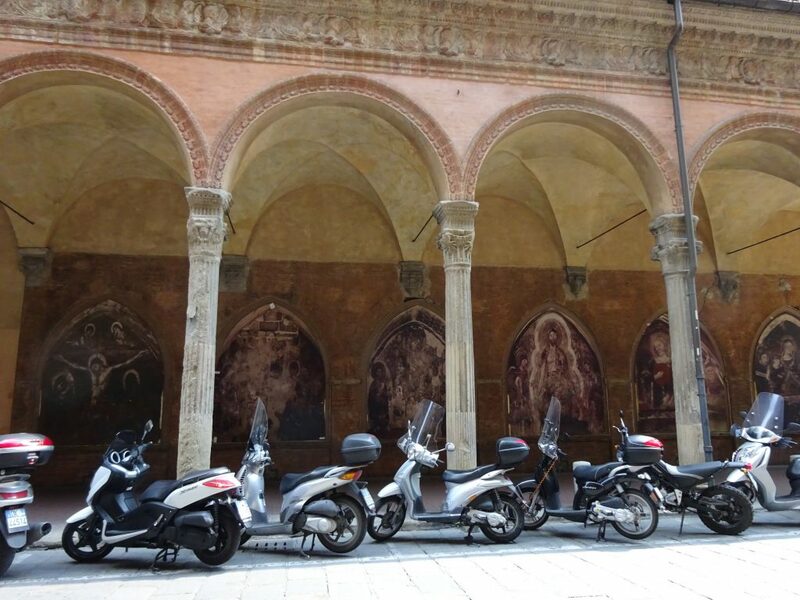 Bologna is also home to the oldest university in Europe, the University of Bologna, so the city has a youthful vibe. 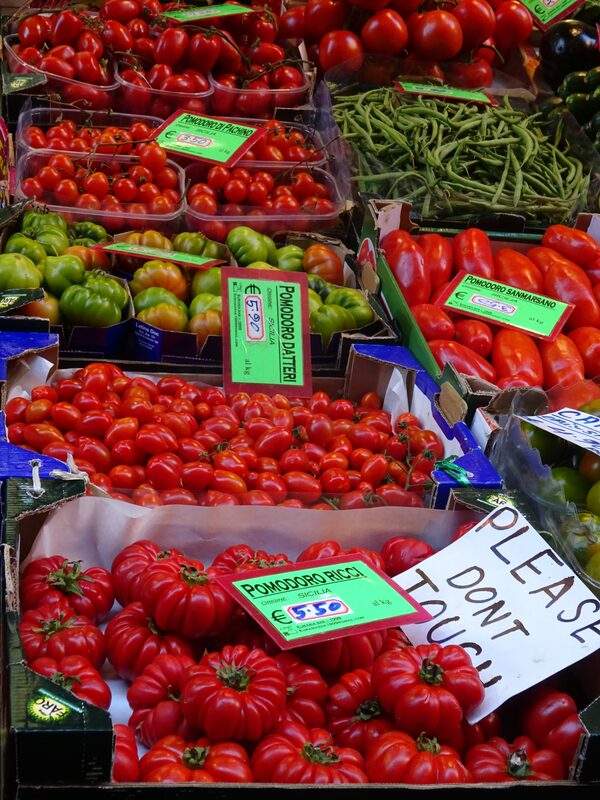 It is often described as the “culinary capital of Italy,” a city that values the quality and source of ingredients above all else, allowing even the simplest of dishes to taste incredible. 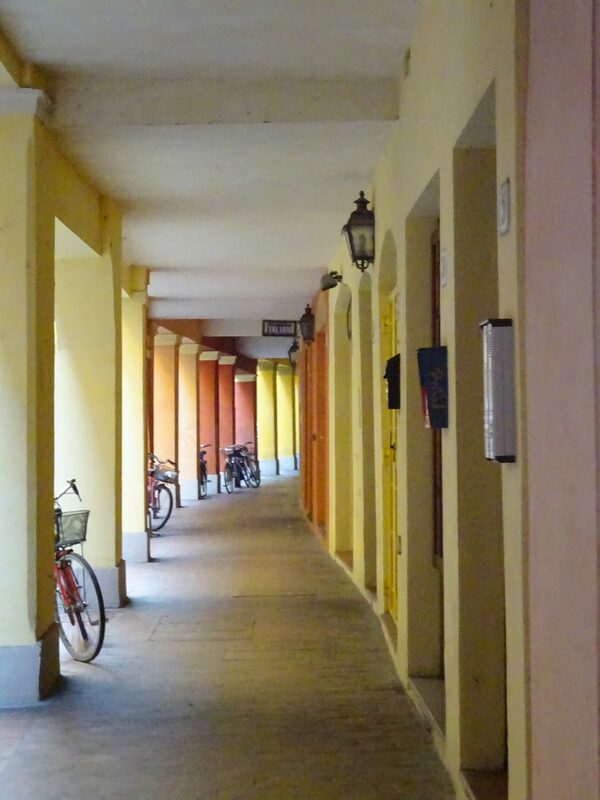 We spent two nights at I Portici in Bologna. I found this hotel on TripAdvisor and we were pleased with our stay here. 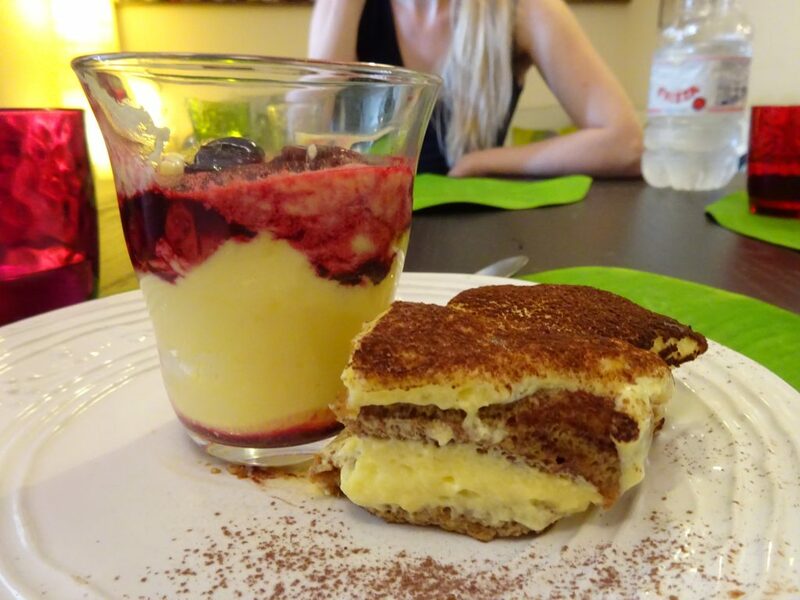 It’s in a great location – we were able to walk to and from the train station, as well as into the heart of Bologna for our cooking class and sightseeing. Rooms are roughly €200/night. The rooms are small, but they are clean and comfortable. I would definitely stay there again. 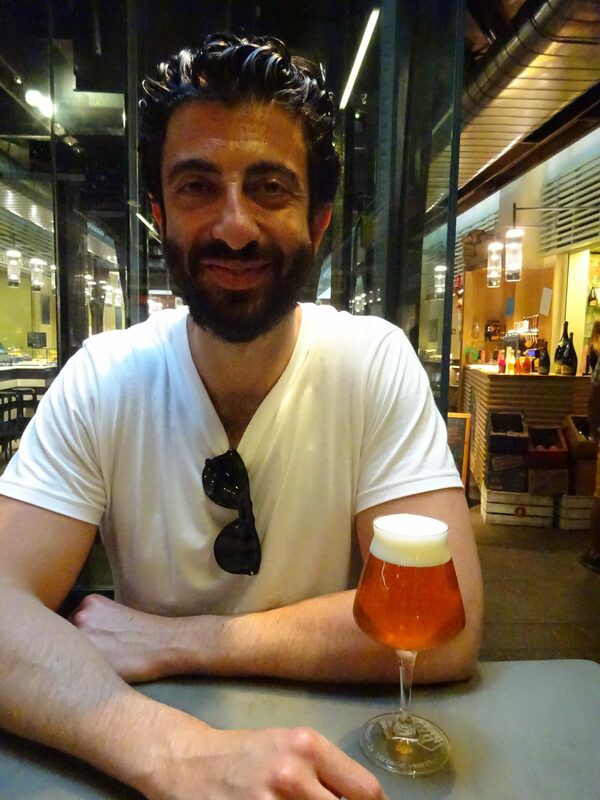 We asked our hotel concierge to recommend a good restaurant nearby for traditional, Bolognese cuisine. 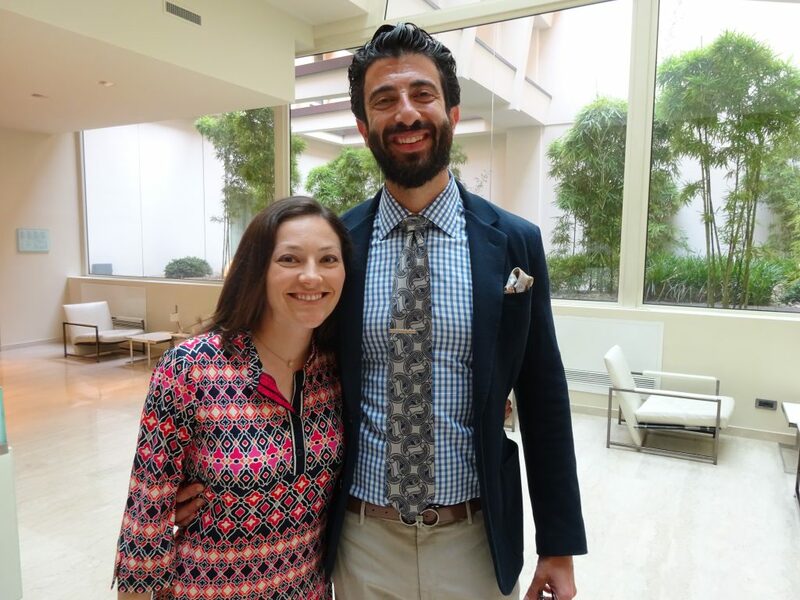 She was able to get us a reservation at Ristorante Teresina. 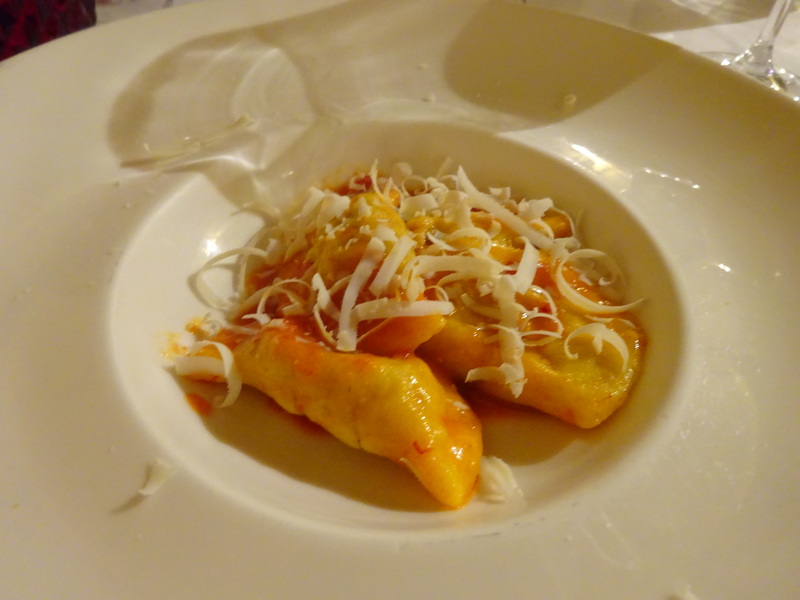 This was just what we were looking for: lots of hearty pasta dishes, and fresh, local fare. 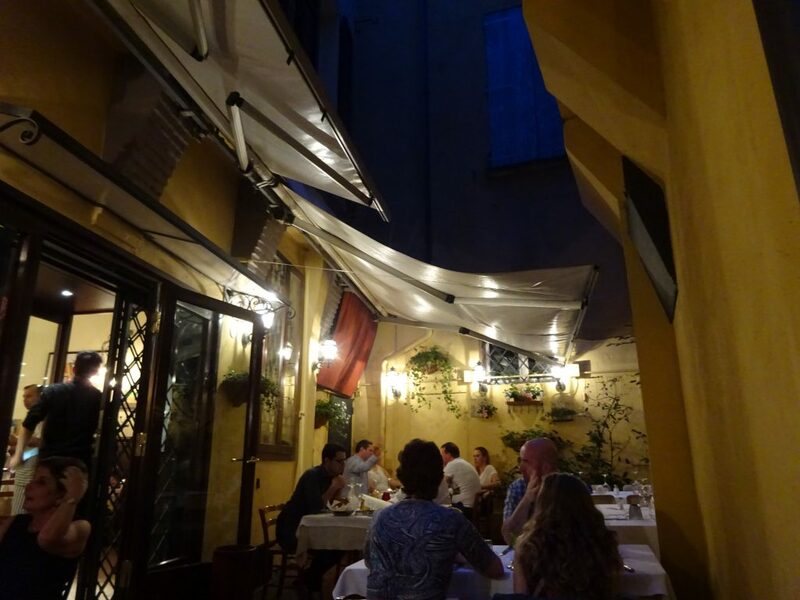 We were able to sit outside in their romantically lit patio and the whole experience felt quintessentially Italian. The next day we strolled around Bologna a bit. 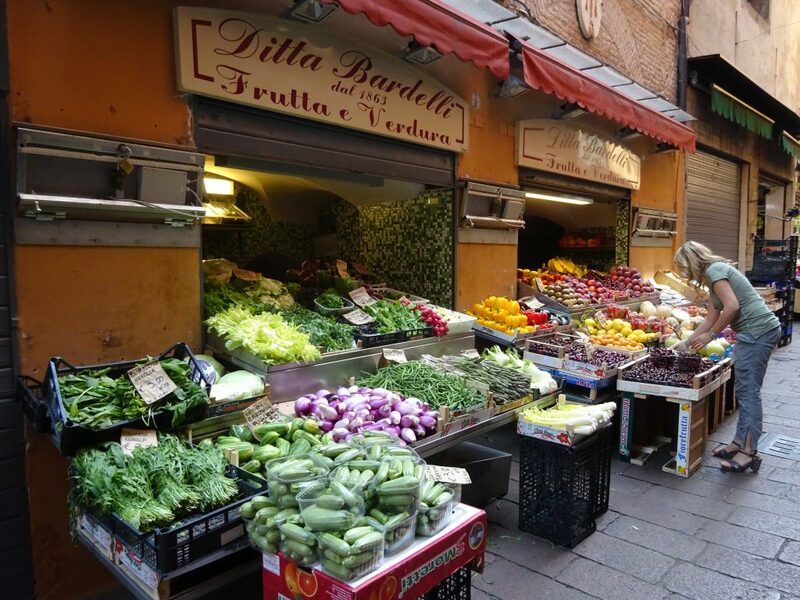 It’s a very walkable city with plenty of outdoor cafés, gelato shops, and piazzas at which to stop. Unfortunately, Rick Steves is not a fan of Bologna for some reason, so if that’s your guidebook of choice, it will not help you in this part of Italy. I managed to find a decent walking tour online that was helpful in guiding us toward many of the city’s landmarks. There’s also a recent 36 Hours in Bologna, which was published after we returned from our trip. 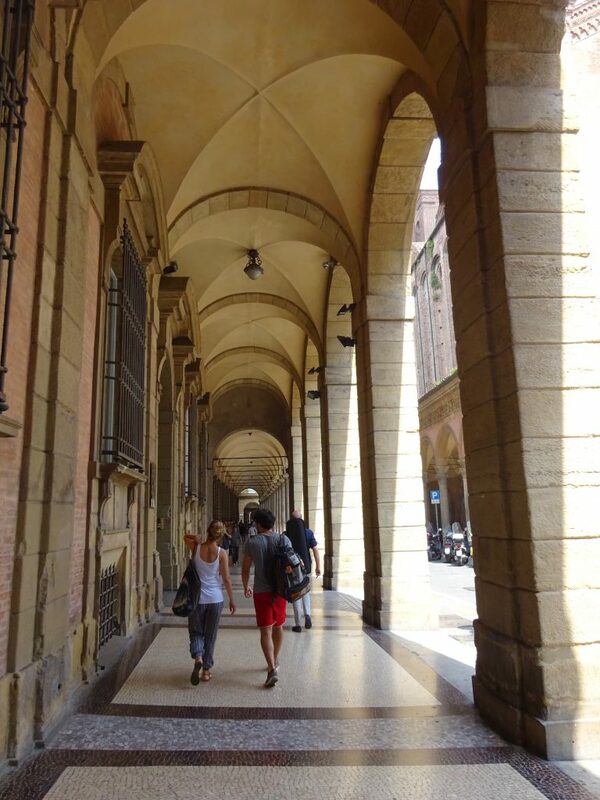 Bologna is known for its porticos, which are covered porches, often with large arches. 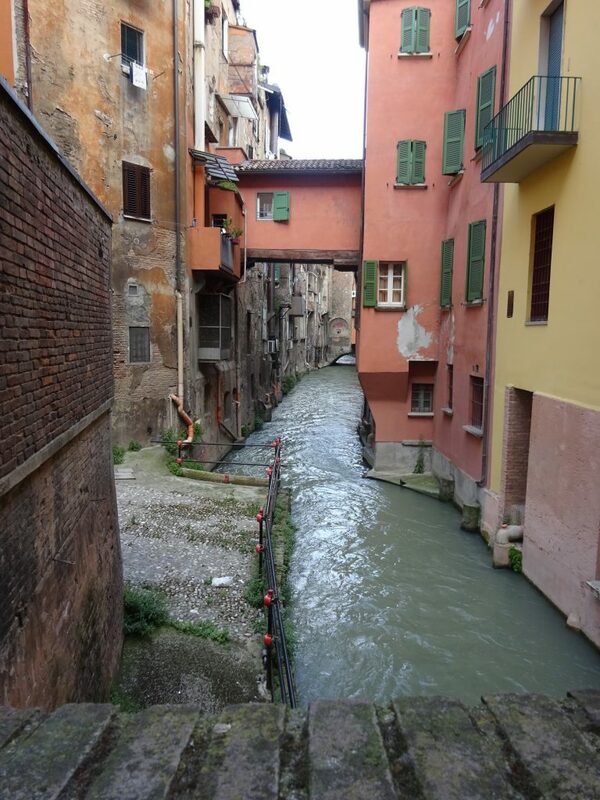 Another gem we discovered on our walking tour was a view of a hidden underground canal. 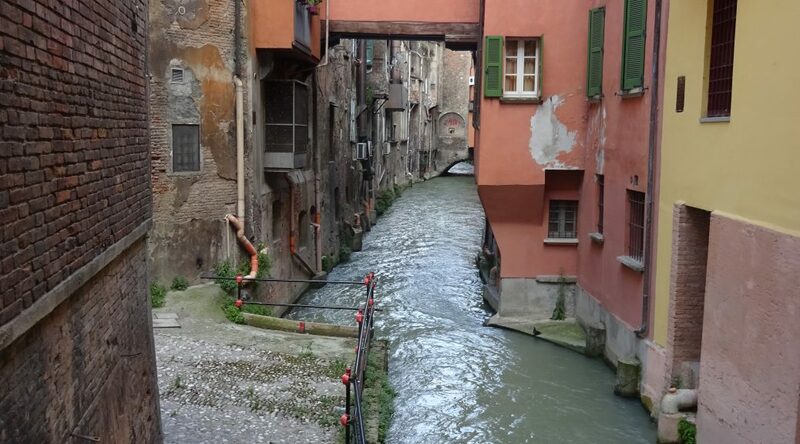 Bologna has an extensive canal system that was built in the 12th and 13th centuries, eventually blocked up and replaced with roads in the 19th century. There are a few spots where you can catch a glimpse of the Venice-like canals (Via Piella 16, near Trattoria Dal Biassanot). 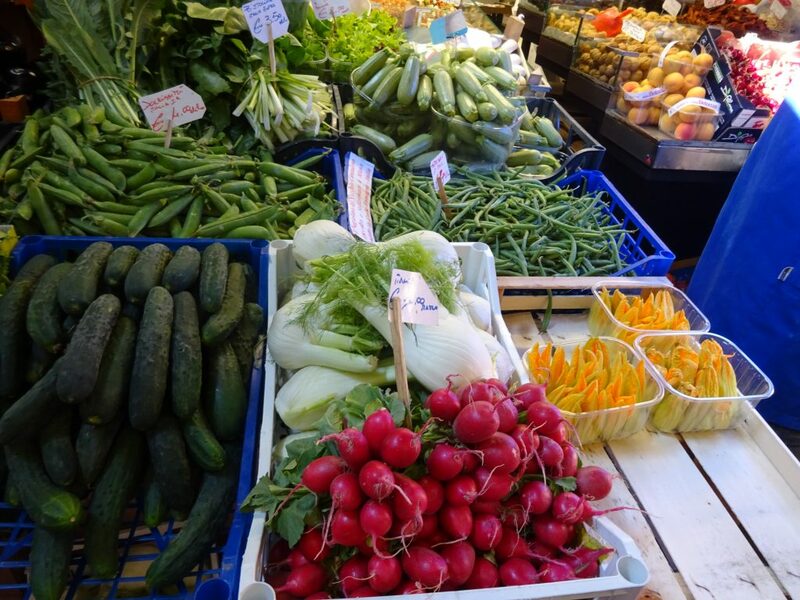 We loved strolling by the open air markets in Bologna. We stopped into Eataly, a large Italian marketplace that has other locations around the world (the original Eataly is located in Turin). We didn’t have time to eat there, but Jack grabbed a beer. From what we could tell, Eataly comprises a variety of restaurants, food and beverage counters, and retail space. It wasn’t as authentic as the other shops, markets, and cafés we saw in Bologna, but it was still a fun spot. In the evening we boarded the local train to Modena, about a 20 minute ride northwest of Bologna. 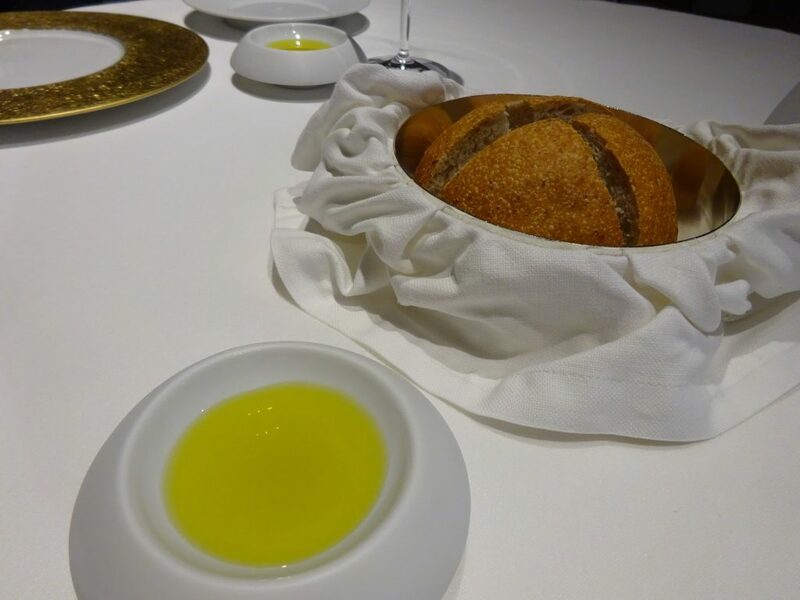 We had made dinner reservations months earlier at Osteria Francescana. 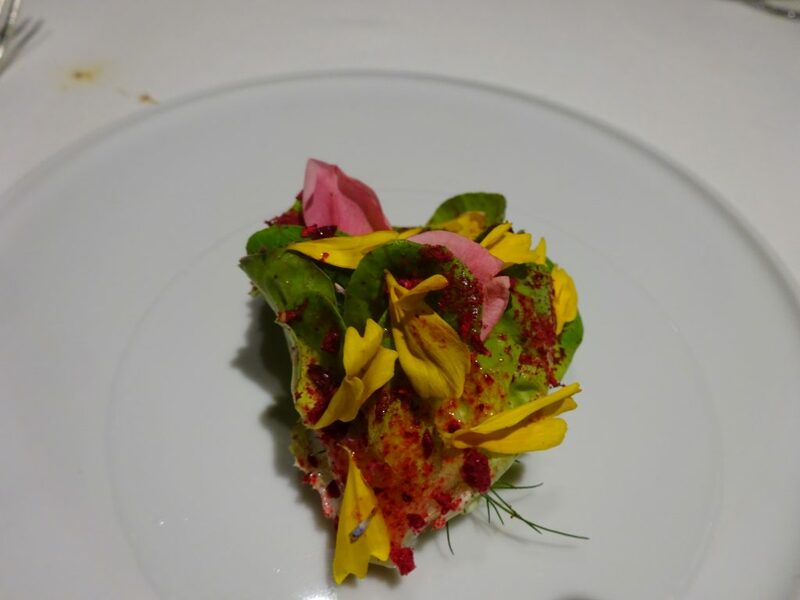 This was before Massimo Battura was featured on Netflix’s first season of Chef’s Table, and before the restaurant was moved from Number 2 to Number 1 on The World’s 50 Best Restaurants list, so I would imagine it’s more difficult to get a reservation now. My strategy for getting these coveted reservations is to look on their website to determine how early I can book, then set an alarm to reserve it the minute it becomes available. You can always cancel if your plans change. Ready to head to Modena! 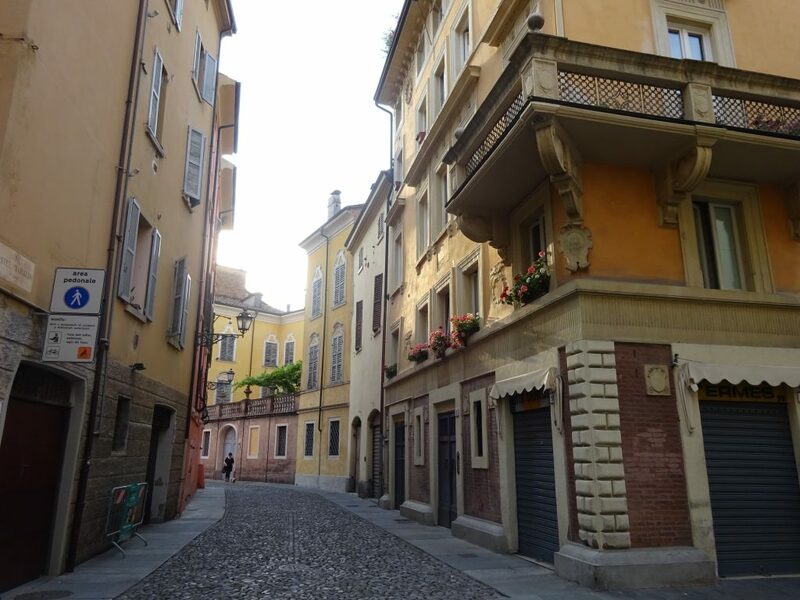 We didn’t spend much time in Modena other than walking from the train to our restaurant, but we were able to appreciate the beauty of the city as the sun was setting. 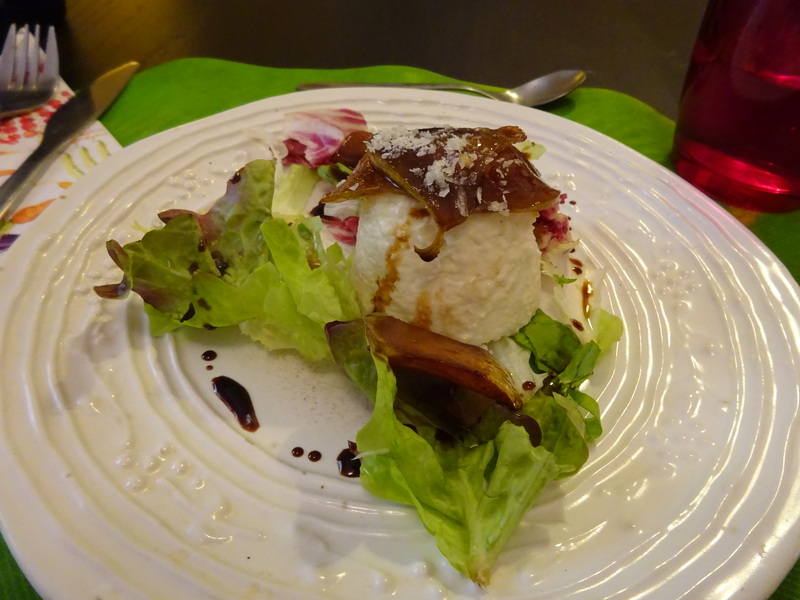 Modena is famous for its balsamic vinegar. 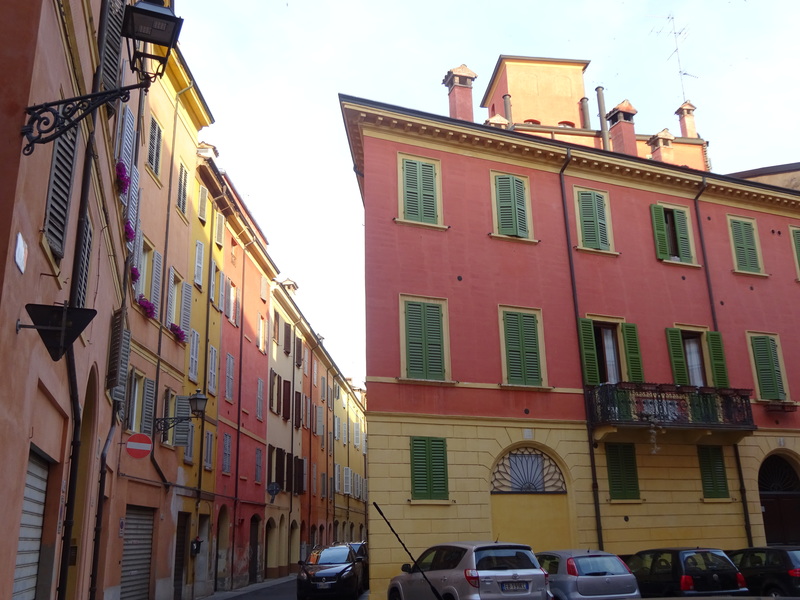 It also happens to be the birthplace of Ferrari, Maserati, and Lamborghini automobiles. We arrived at the restaurant early and we got to observe the staff kicking the soccer ball around outside in the setting sunlight. Running a high end restaurant must be so stressful, and I was impressed that the staff was able to relax and have fun before dinner started. 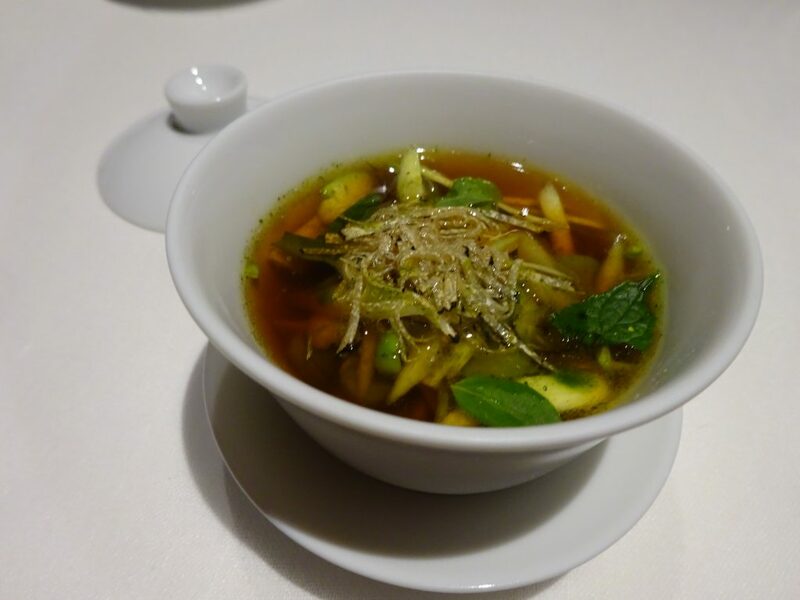 We grabbed a drink at a café nearby, then headed to arguably the best meal we’ve ever eaten. 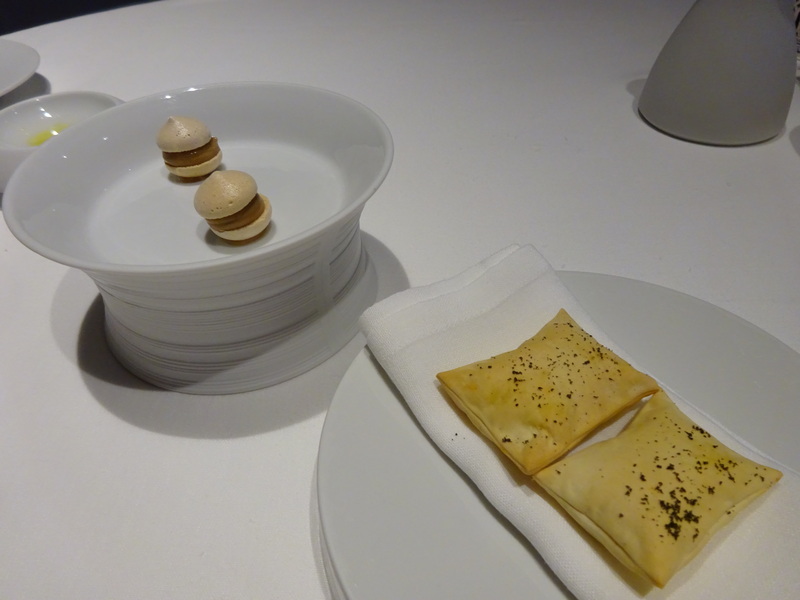 We were given a choice between the “Tradition in Evolution” tasting menu (Massimo’s take on traditional Bolognese dishes) and “Sensations” (seasonal plates from the “experimental kitchen”). 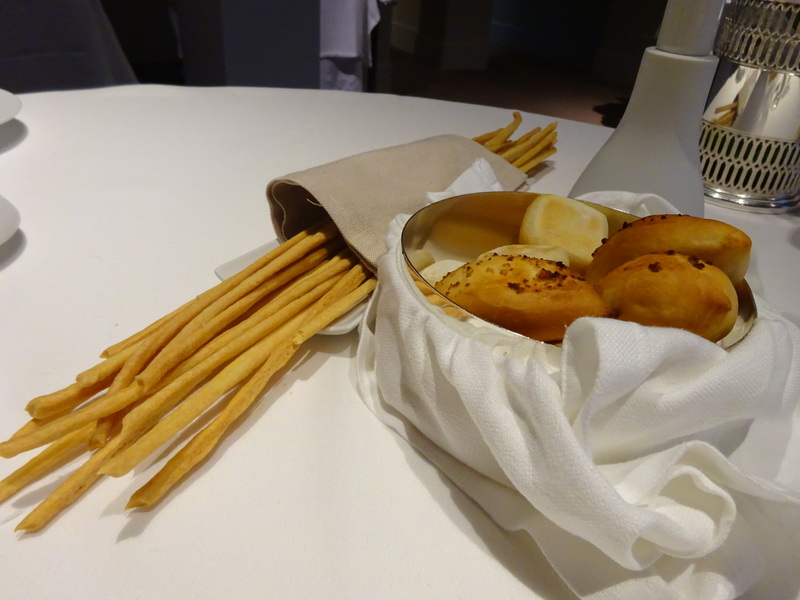 As we were hemming and hawing over which tasting menu to choose, our server offered us a third option: a combination of the two menus. Perfect! We also opted for the wine pairing. We started with bread and snacks. 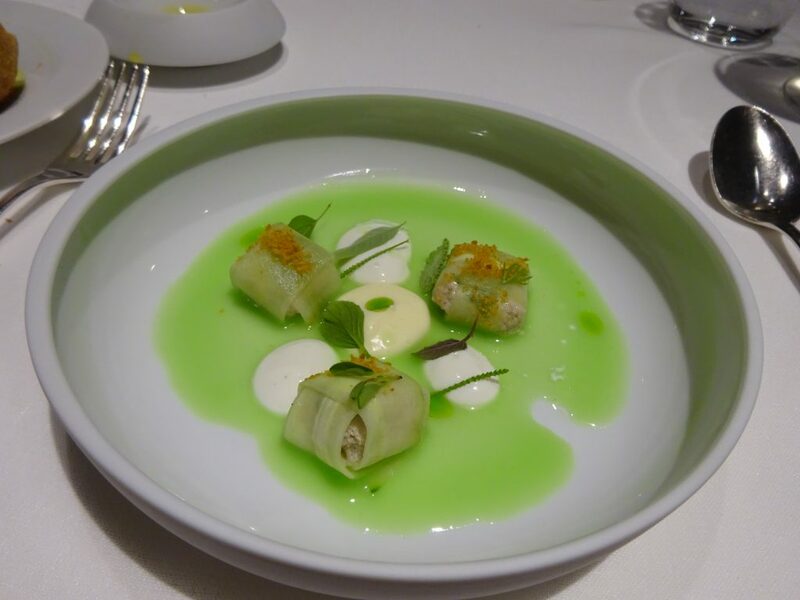 The dishes that followed were so unique and delicious. 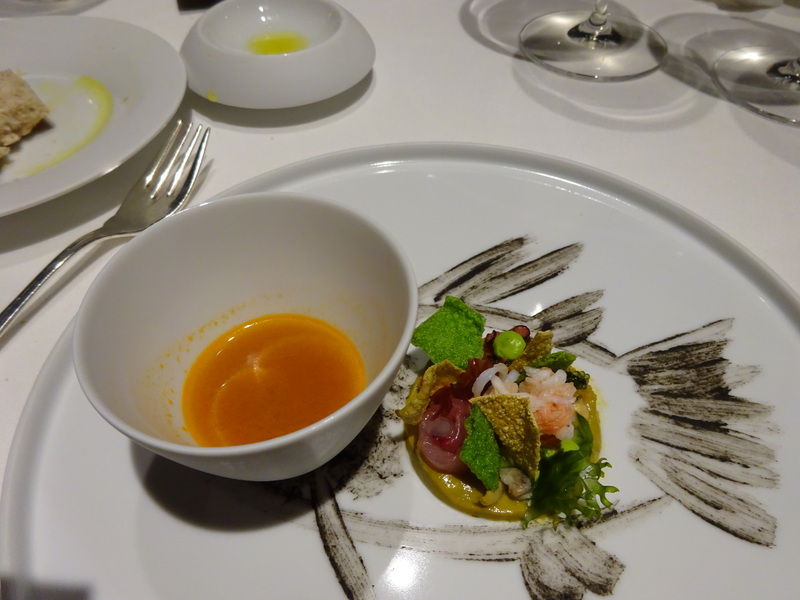 Everything was light and fresh, and the flavors would build with each subsequent course. The wine pairing was phenomenal. 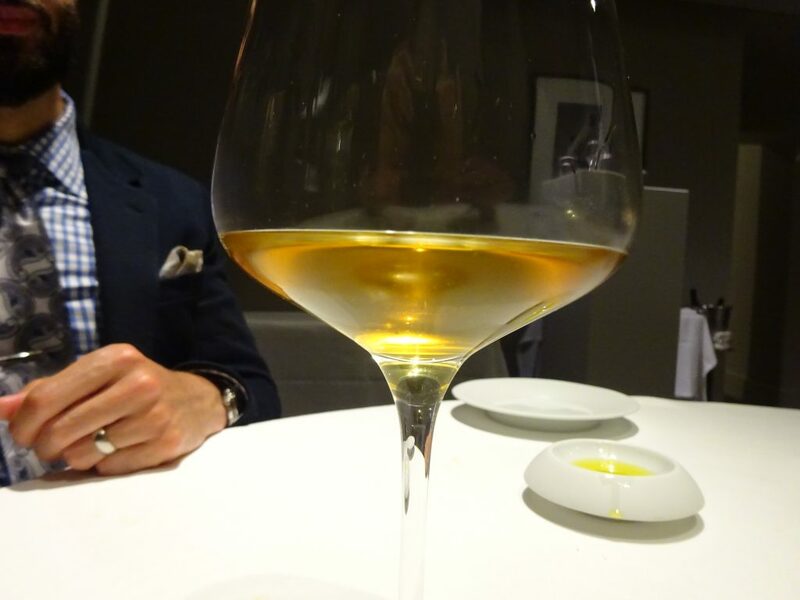 We were mostly served white varietals, but we had this really unique glass of “golden wine.” I wish I had written down what it was. 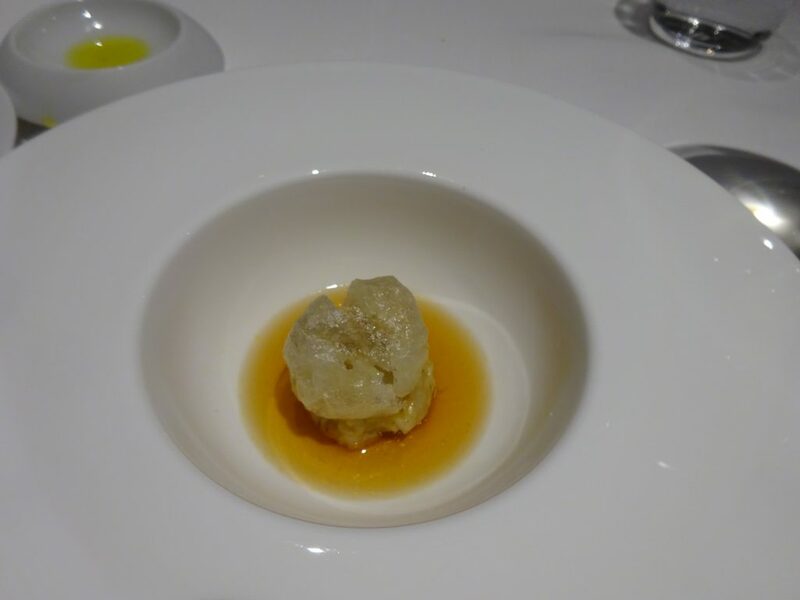 The next dish was featured on Chef’s Table: Five Ages of Parmigiano Reggiano in Different Temperatures and Textures. This was an homage to the cheese from nearby Parma. The flavor was exquisite. 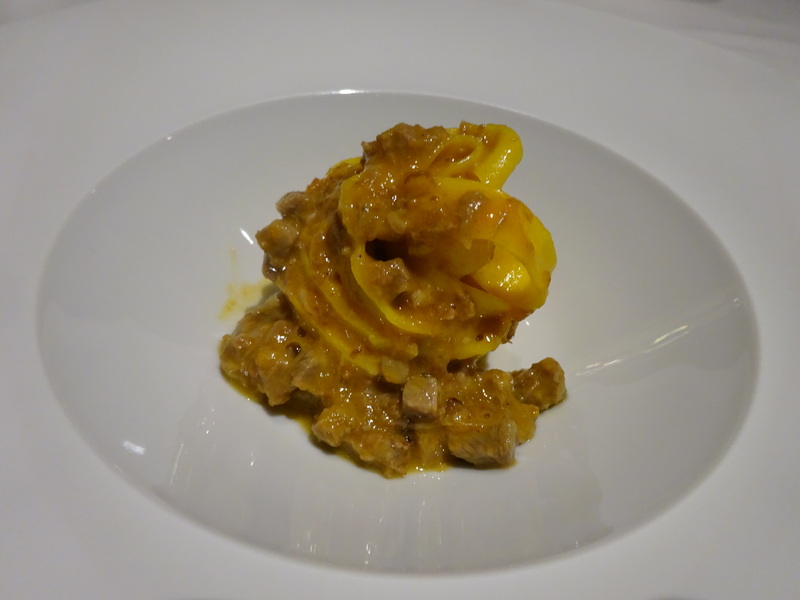 Next was Massimo’s take on a classic Bolognese dish: Tagliatelli with Ragú. It was incredible. The fresh pasta was cooked perfectly and was served with just the right amount of sauce. The next dish was veal, which I’m not too keen on eating for ethical reasons. 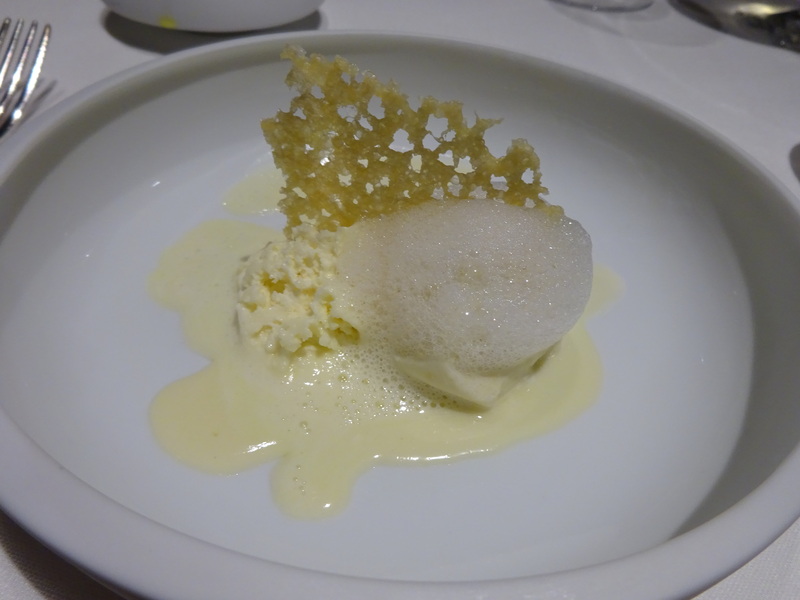 But I made an exception for Osteria Francescana. 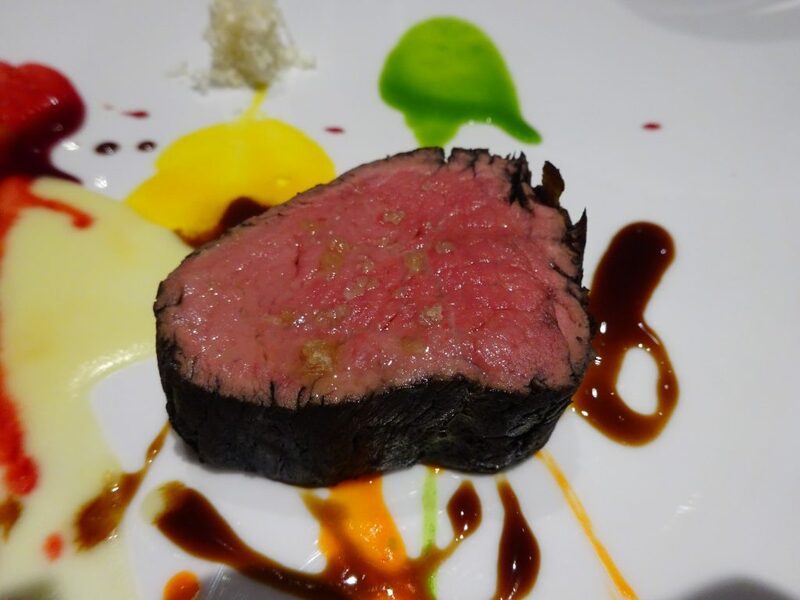 It was cooked using the sous-vide method (sealed in an airtight plastic bag then placed in a water bath), which allows for even cooking and the perfect level of doneness. The blackened “grill” marks were added to give the appearance of being flame grilled, but it in fact was not. 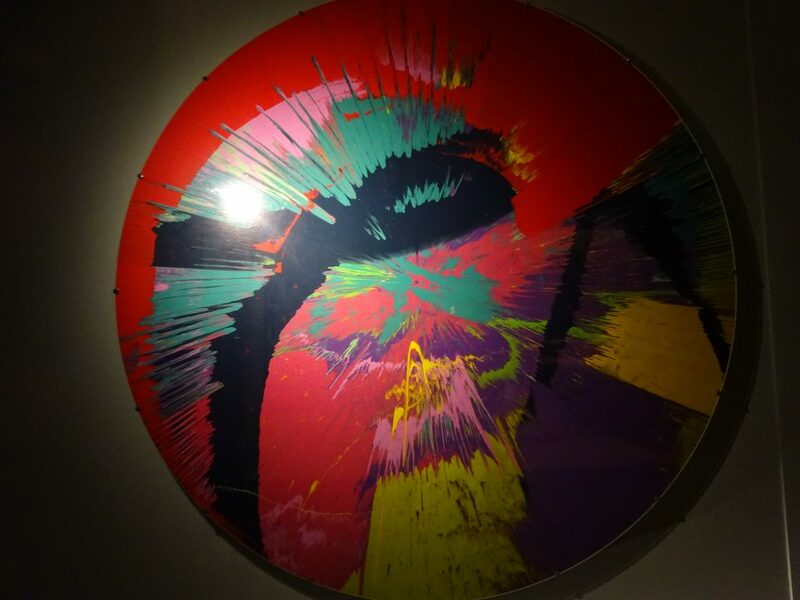 Massimo calls this dish “Beautiful, Psychedelic, Spin-Painted Veal, Not Flame Grilled.” The plate decorations were inspired by a painting that hangs in the restaurant. 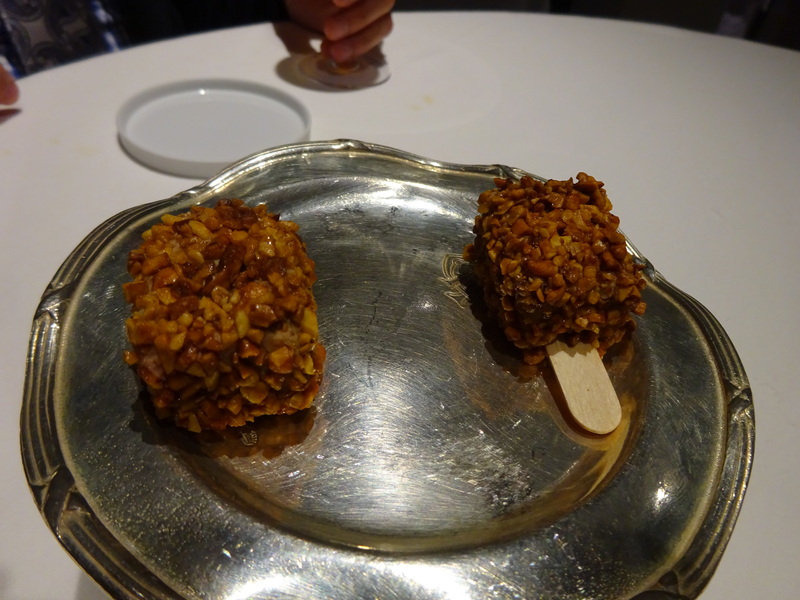 The first of our dessert course were foie gras “popsicles.” I’m also not a big fan of foie gras, but I will eat it on occasion at these fancy restaurants. 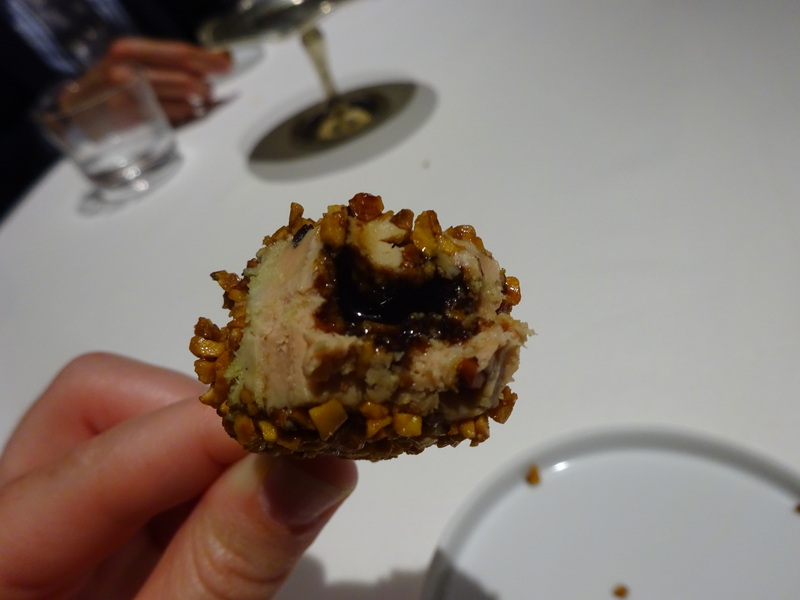 The foie gras was filled with local balsamic vinegar that was aged 50 years (so it was sweet and syrupy), covered in almonds from Sicily. It was so rich that I only had a few bites, and it was full of flavor. 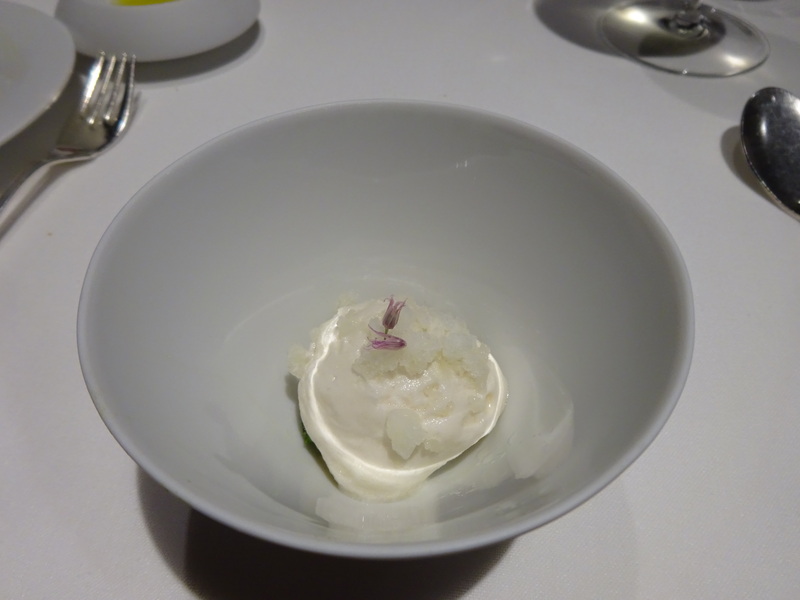 The next dessert was “Caesar Salad in Emilia.” I have no idea what was in the dressing, but it was sweet and delicious. Very refreshing. 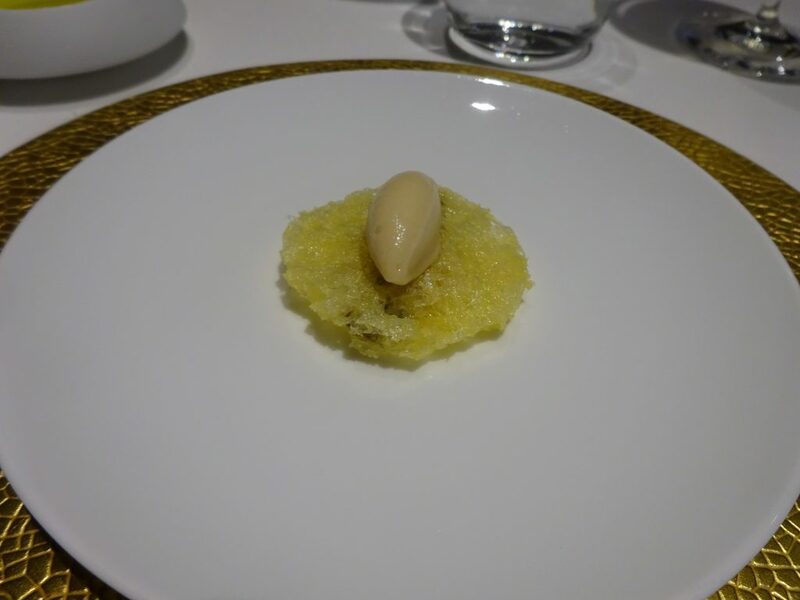 For those of you who watched Massimo’s Chef’s Table episode, you will recognize “Oops, I Dropped the Lemon Tart.” The dessert was born when one of the the chefs at Osteria Francescana accidentally dropped one of two lemon tarts right before service; Massimo’s answer was to break the other tart as well – and this iconic dessert was born! In Situ in San Francisco currently serves this dessert on their menu. 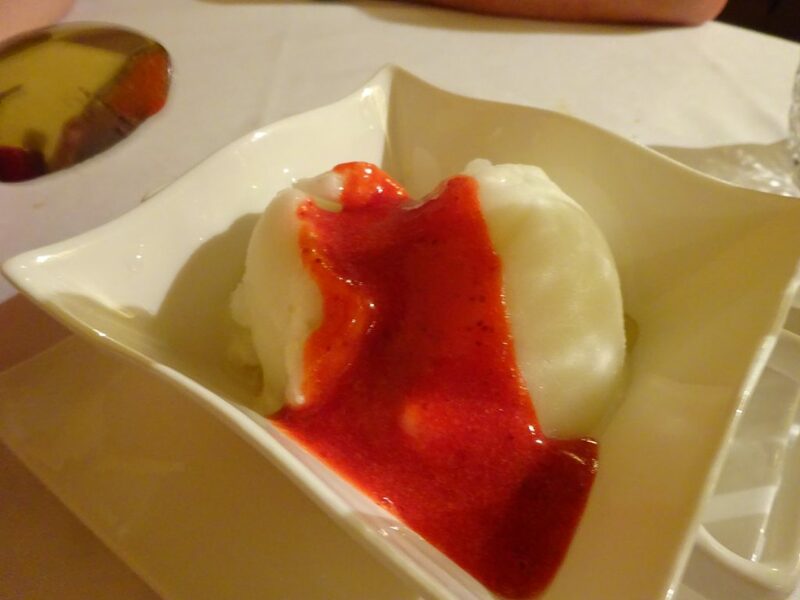 Next we were served a dessert that reminded me a lot of the molecular gastronomy we experienced in San Sebastian, Spain. 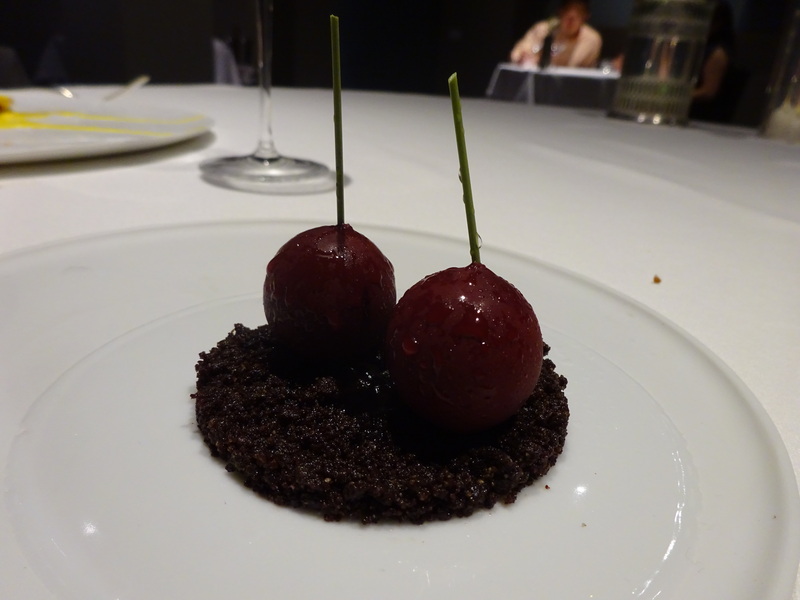 These cherries looked and tasted like cherries, but they were made of chocolate. They were served over a chocolate cookie crumble. As if we had room for anything else, we were served a series of small desserts to round out the meal. 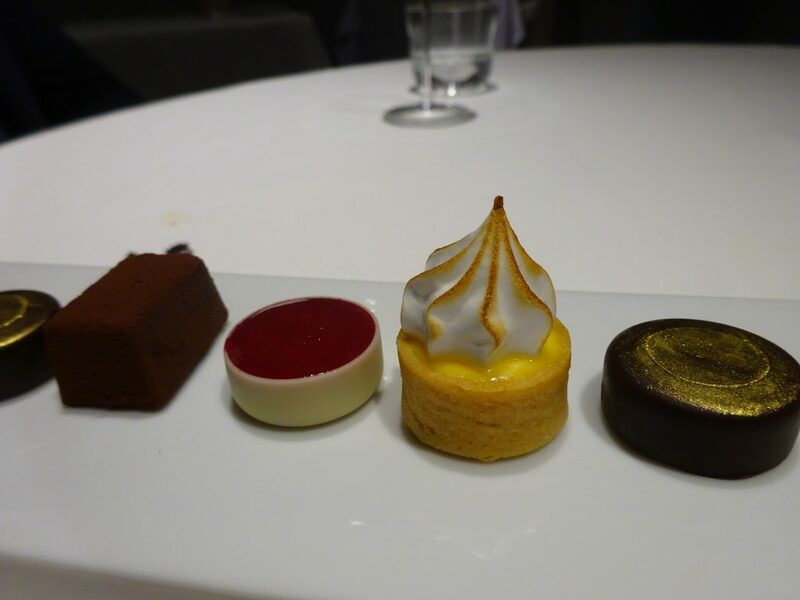 I of course tried each one; the tiny lemon meringue pie was my favorite. 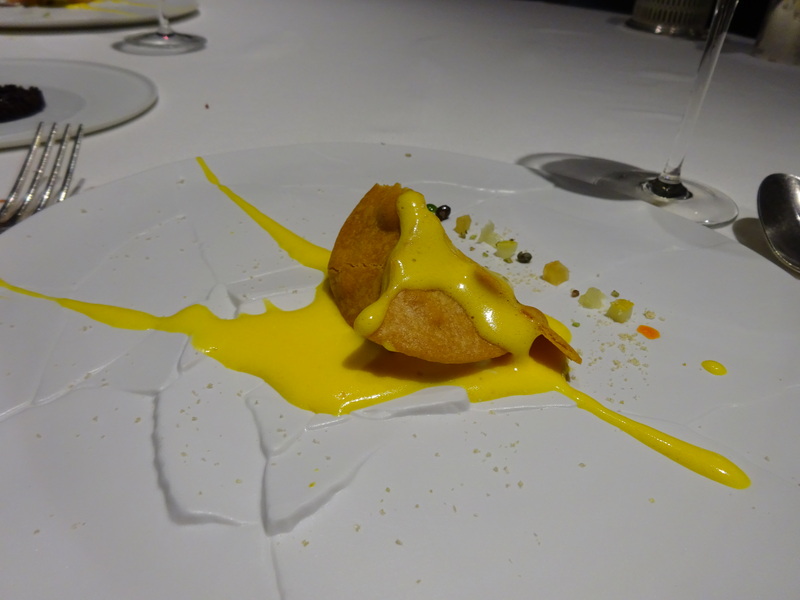 Our dinner at Osteria Francescana was incredible. Jack likes to say, “it was the best meal of my life, which makes me sad, because I may never have a meal that good again.” I’m a bit less fatalistic about it; these restaurants are all so different that it’s difficult to say with certainty which is the “best.” But Osteria Francescana was a wonderful experience that we will never forget. 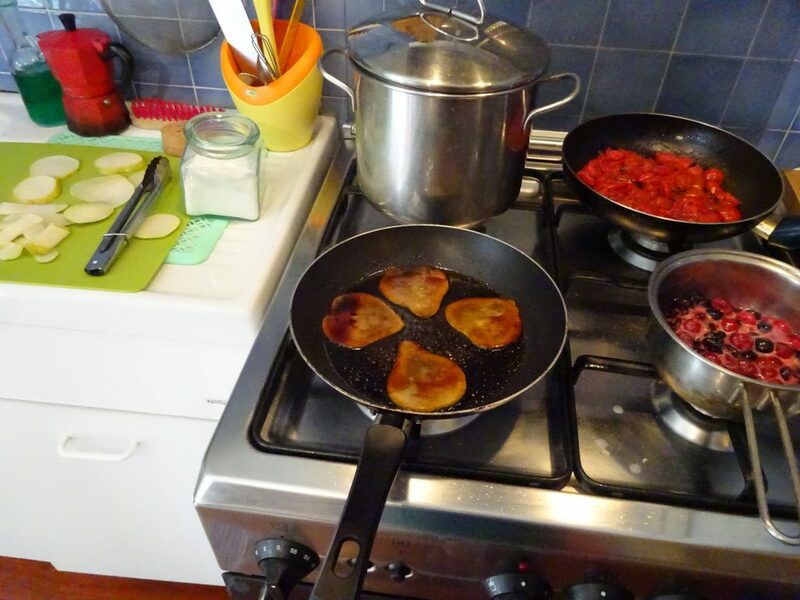 The next day we participated in a cooking class in Bologna. Friends of ours had taken the same class several years earlier, and it came highly recommended. 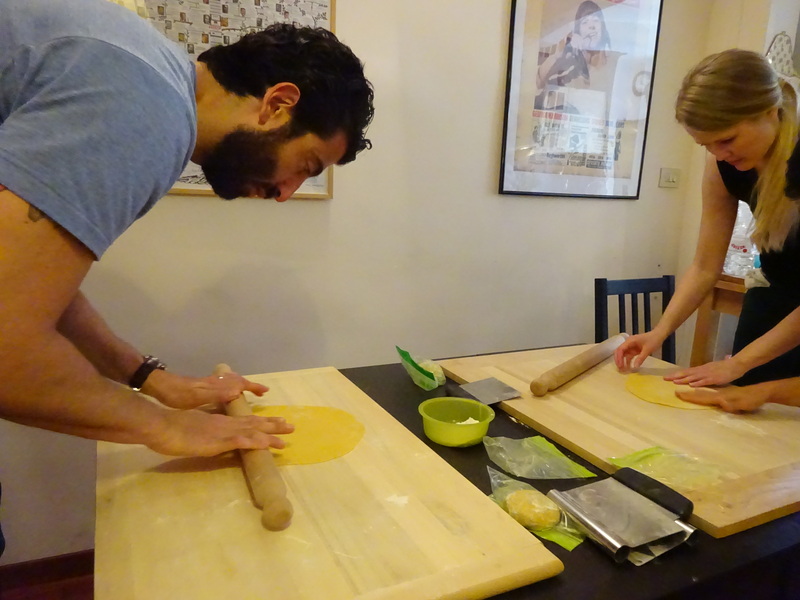 We booked the Traditional Bolognese Pasta class with market tour via Taste of Italy (€255 total). Our class was taught by Joanna, who was fantastic. She had grown up in Chicago, so her English was easy for us to understand. We were in a small group with one other couple from Norway. 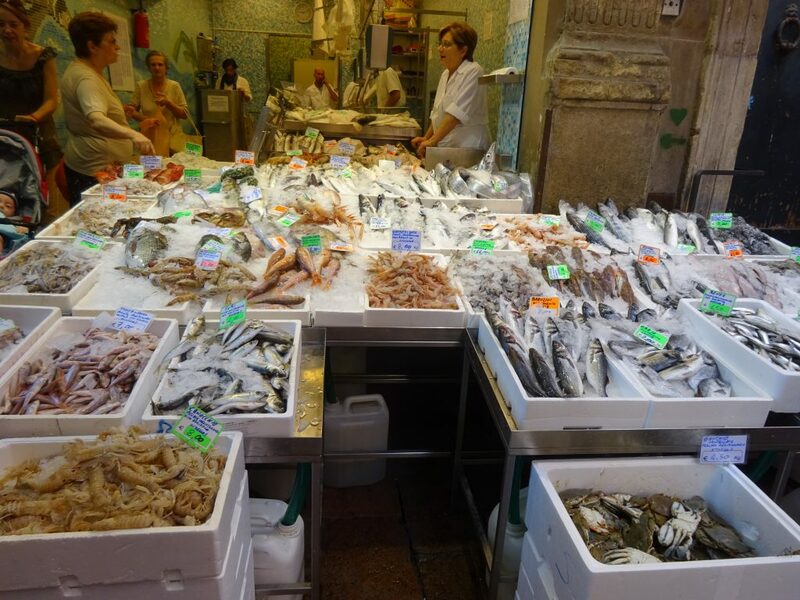 We met up near the center of town where a lot of the outdoor markets are located. 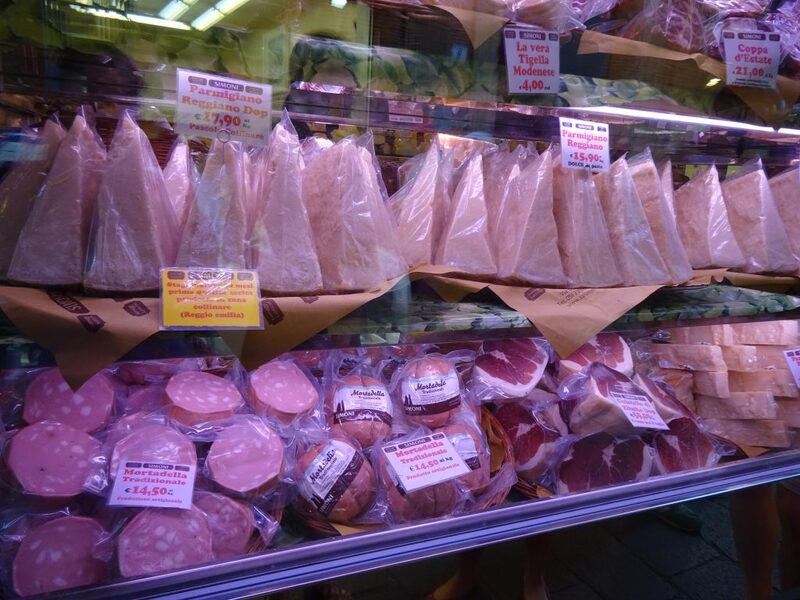 We strolled from shop to shop, market to market, learning about Bologna and its local cuisine, and getting inspired for dinner. 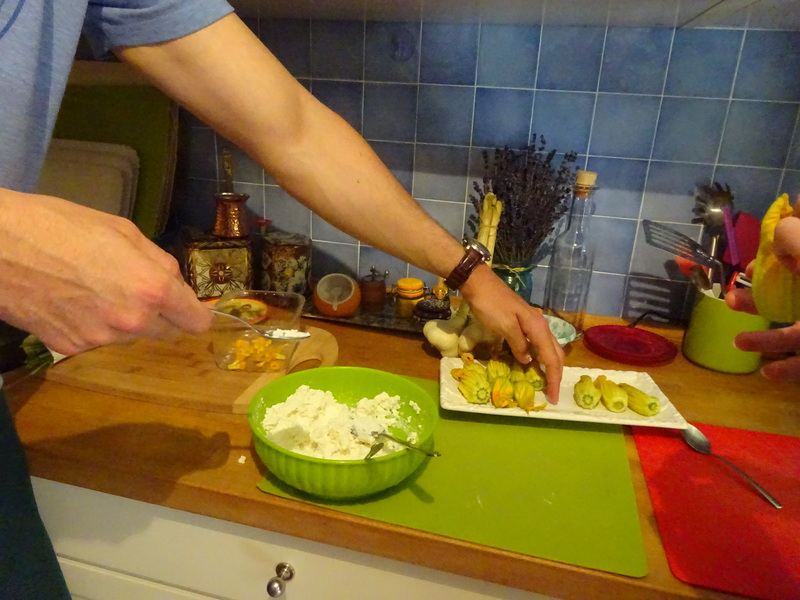 We ended up finding some beautiful looking zucchini blossoms, so Joanna decided we should stuff them with ricotta and fry them for an appetizer. Yum! After the market tour, we walked to Joanna’s apartment at the edge of town. 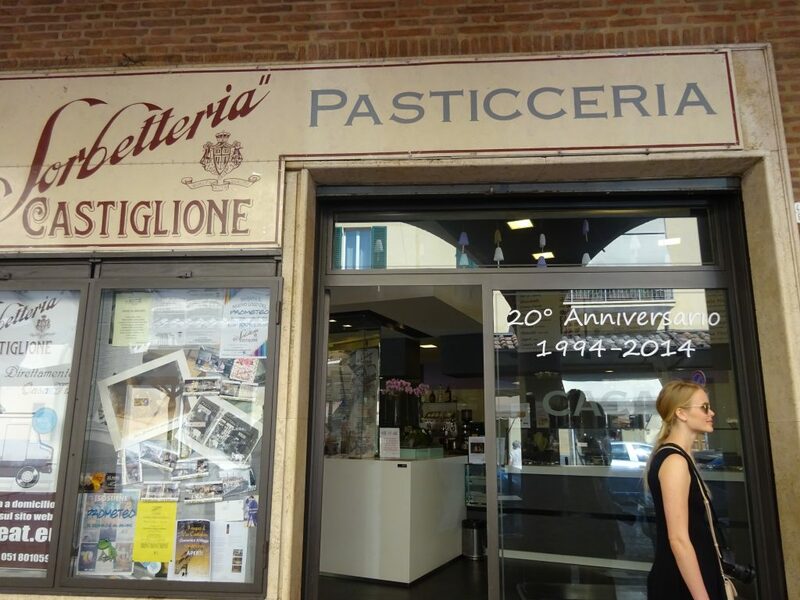 On our way, she pointed out her favorite gelato shop in Bologna; we didn’t have time to try it out, but it is called La Sorbetteria Castiglione. It is also recommended in the Lonely Planet guide – they suggest trying the gianduia flavor (chocolate hazelnut ice cream with whole hazelnuts inside). Joanna welcomed us into her home and we got straight to cooking. 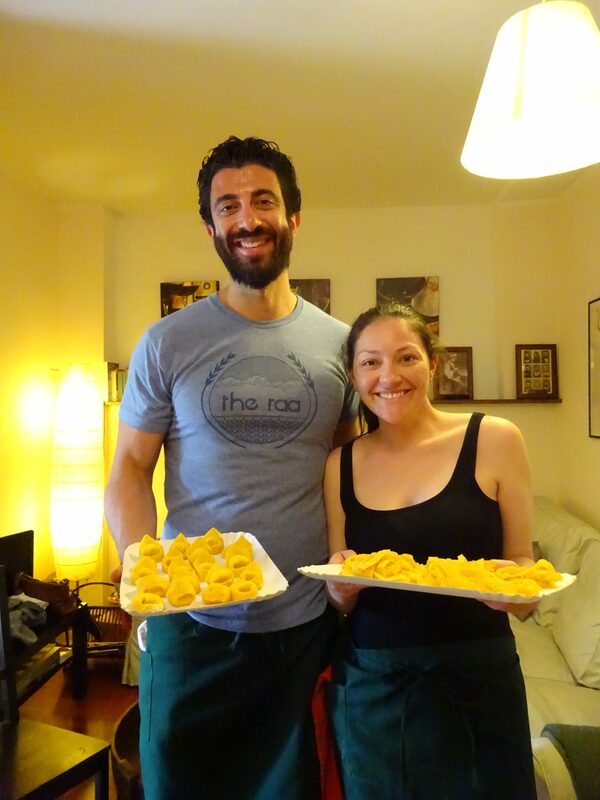 She taught us how to make fresh pasta, both tagliatelle and tortelloni stuffed with ricotta and parmesan cheese. 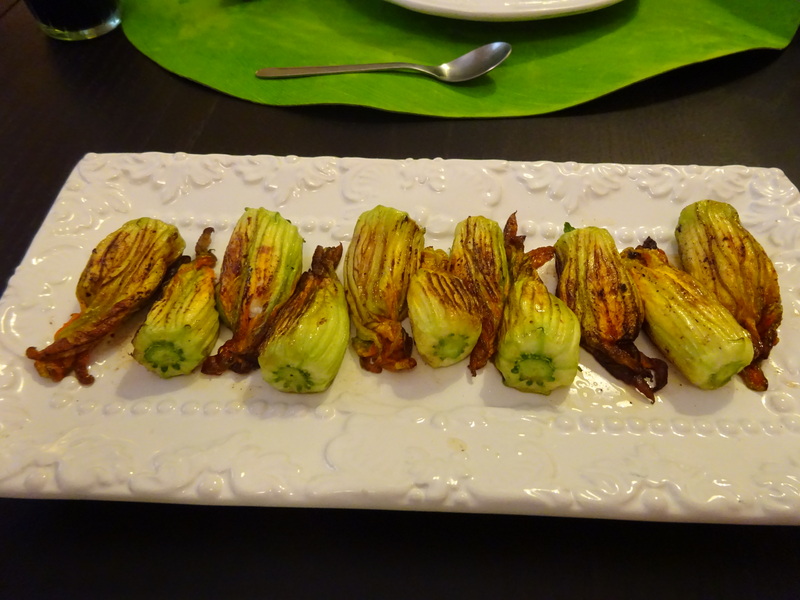 We also made the stuffed zucchini blossoms, a savory panna cotta with grilled pear and salad, classic tagliatelle with ragú, tortelloni with tomatoes and basil, with tiramisu and cherries with cream for dessert. We all shared the cooking duties, then ate as a group with wine that Joanna shared with us. 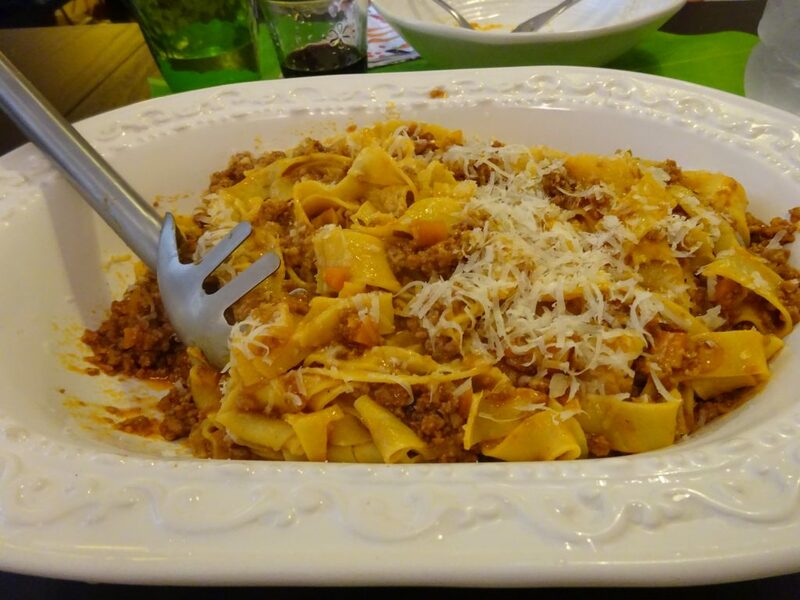 We had a fabulous day learning about and eating classic Italian and Bolognese cuisine. 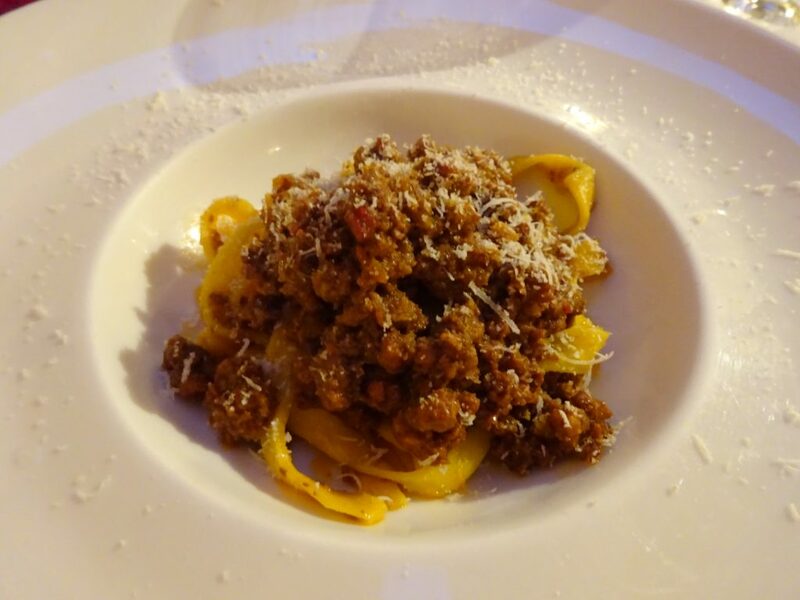 We learned that many of the local dishes are very simple to prepare, with very few ingredients; the key is getting the very best quality ingredients – fresh produce picked at the peak of season, aged balsamic vinegar from Modena, local Parmigiano-Reggiano cheese. It was a good reminder of the importance of “slow food” – grown, prepared, and eaten slowly, while preserving quality and flavor. 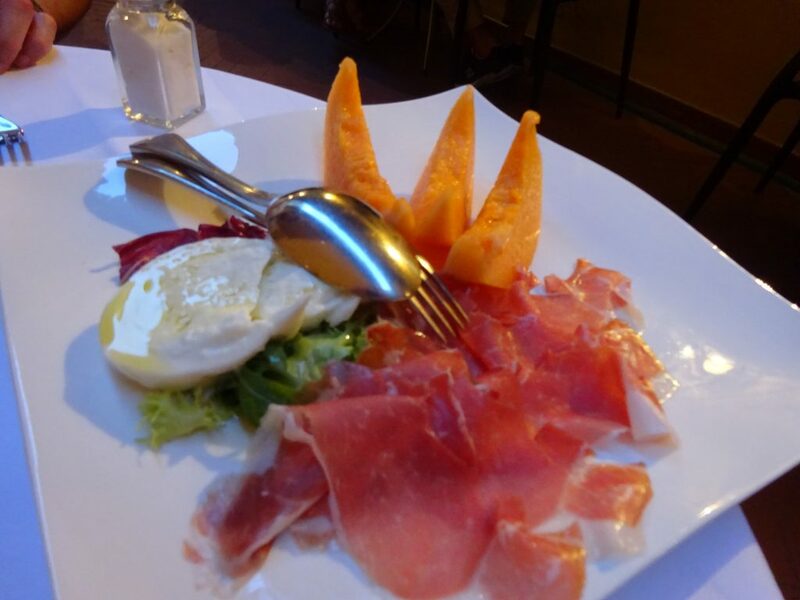 Emilia-Romagna is a special region of Italy, one that I whole-heartedly recommend visiting if you have a good appetite and discerning palette.